I’ve been deploying Social Media for Fortune 1000 corporations since 2005. When I first started at Hitachi Data Systems, I thought I was late to the game. Since then, I’ve been helping PodTech’s clients, there were varying levels of sophistication for sure. As I move on to the next role, I’ll be looking at the industry from an even larger perspective. I’m absolutely convinced that culture (how people act and think as a collective) directly influence their level of sophistication. Executive leadership clearly influences cultures, which changes priorities for social media. There are still some companies that are answering the questions in 2005. The tech industry was the first to adopt these tools with great excitement, it’s native to many of these corporations, although there are exceptions. Larger enterprise IT corporations seem to be slower at adopting these tools externally or internally. I’ve noticed that the larger corporations in 2007 were able to put budget, headcount (such as the community manager role) and resources towards social media. For smaller companies (startups in particular) these efficient and cheap tools are native. Sadly, the mid-sized company often is slower in deploying, why? Often the Marketing director is managing so many programs, web, marcom, field marketing, PR, that they don’t have enough cycles to take a breath and see what’s happening. 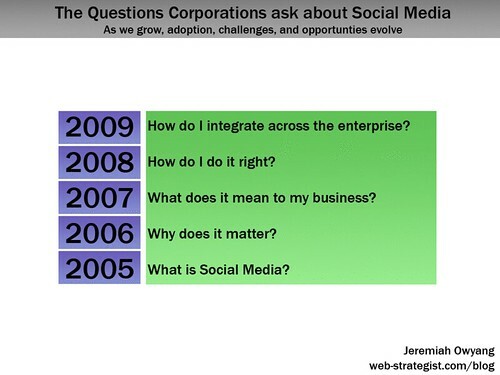 2005: What is Social Media? For many folks, corporations, the question to answer was “What is a BloB”. Blogging was the primary tool that we saw in the marketplace, for some, it wasn’t taken seriously, for the savvy, they quickly adopted. We saw scare tactics from the threatened mainstream media, such as “Attack of the Blogs” and light of amateurisms, angry customers and crazies were painted. For many, we wanted to know what are these tools, how to they work, and what’s the impact. Early on, this impacted corporate communications, PR, and mainstream media. 2006: Why does it matter? As we’ve evolved, many were realizing the impact of exploding batteries, brand hijacking, and blog evangelism. Savvy companies were starting to adopt these tools, a few provided integrated communities that were scrapped together or built from existing platforms. For the majority, trying to understand why these tools matter to a business. In addition to corporate communications, PR, we started to see other marketing and business units being impacted by these tools, as well as adoption. 2007: What does it mean to my business? We’re here now. This is the year of ROI, measurement, and experimentation. Many corporations have deployed resources, headcounts and budgets. Corporations are afraid to make mistakes, so plans are created, and measurement is critical to help manage and prove the worth of new programs. ROI was proven, new social media measurement attributes were defined, and many new tools were deployed, I did what I could to further this industry (see all posts). In addition to Corporate Communications and PR, business units are starting to experiment with these tools, often out of the PR budget. A new role started to appear more frequently, the digital marketing manager, the community manager, the social media strategist. 2008: How do I do it right? Now that experimentation is done, and business units are starting to apply these tools, like advertising, PR, field marketing, and customer references, companies will want to do it right. Frameworks will be developed, consultants will offer packages, and a loosely developed process will be used. For companies that don’t have enough internal resources to listen, manage, and deploy, consultants will be a very sought after service. Nearly every brand will start to have an ongoing budget for social media, the new role to manage these tools will appear. IT departments will start to deploy enterprise 2.0 tools. Normalization is happening, A checkbox for ‘social media’ on every announcement, product launch, product development and support will be using these tools. Social media tools to listen, converse, collect knowledge, and build new products will integrate across the customer cycle. It’s not just external, intranets will start to deploy suites for collaboration, such as blog accounts issued to many internal and external employees. Product Teams, IT departments, HR, Finance, Executives, and of course Marketing will be using these tools. What happens after 2009? I’m not sure yet, I’ll let you know next year. Love to hear your feedback. Update: Steve Rubel writes about a new role, the Geek Marketer, which some prefer to call the Web Strategist. Link via Sam.